Clean dryer vents. Clean dryer vents frequently and empty lint screens after each load. Carbon Monoxide detectors. Consider installing a carbon monoxide detector to add extra safeguards against hazardous situations. Maintaining heating equipment. Faulty heating equipment plays a part in over 40% of winter home fires. You can help prevent fires by safely maintaining and operating your furnace, space heater, or wood stove. Have a qualified technician inspect your furnace, water heater, and fireplaces every year. Door locks. Never install a double-cylinder deadbolt lock on your exit doors. They require a key to unlock from the inside. When you need to exit in a hurry, this type of lock can be deadly. Electrical hazards. Replace any cord that is cracked or frayed. If an appliance smokes or has an unusual smell, unplug it and have it repaired by a professional. Matches and lighter safety. Store all matches and lighters up high, preferably in a locked cabinet. Smoke detectors save lives! 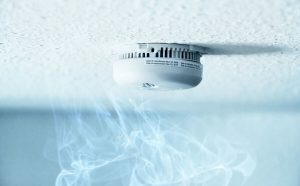 Make sure that your smoke detectors are in good working order. Change the batteries twice a year when you change the clocks for daylight savings or use smoke detectors with 10-year lithium batteries. You should have one smoke detector inside each sleeping room and one outside of the sleeping room. At a minimum, there should be at least one detector on each floor. City ordinance requires all land lords to provide renters with an appropriate number of smoke detectors. Practice candle safety. You should never leave a lit candle unattended in any room of the house. Make sure not to burn a candle near any combustible materials such as curtains, drapes, and bedding. Always extinguish all candles before going to bed at night. Practice your escape plan in case of a fire. Have a meeting place outside of the home such as a neighbor’s yard to ensure that all members of the house are safe and accounted for. Also, once you have made your way out of the house- NEVER go back inside! Matches and lighters are not toys. Keep all lighters and matches up high or locked up so that children cannot access them. These are very dangerous tools in the hands of children. The Pittsburg fire department provides a Juvenile Fire Setters program which works directly with your family to provide valuable fire and burn education including the consequences of playing with fire. Use electricity safely. If an appliance begins to smoke or smell unusual, unplug it immediately and have it repaired. Make sure that all electrical cords are in good working order, free of cracks and frays, and never run cords under rugs for any reason. Never overload outlets, only plug as many items as the outlet calls for. Remember that fuses protect you from fire, do not tamper with the fuse box or fuses. Also, make sure that the fuses being used are the correct size. Educate your children. Teach your children what they should do in case of a fire. If they wake up at night and smell smoke they should get as low as they can to the floor and make their way to the door. Before opening the door they should feel the door with the back of their hand to see if it is hot. If the door isn’t hot they may proceed out and make their way to your designated meeting area outside of the house. Also, make sure that they know to call 911 in case of an emergency. Smokers be careful. Never smoke in bed or if you are sleepy. Carelessly discarded cigarettes are the leading cause of fatalities in residential locations. More information on smoke detectors from the Fire Marshall. Rules and information to contact for burn ordinance permit.